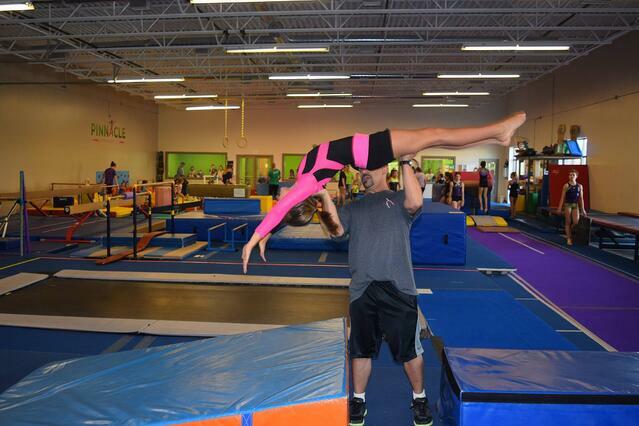 Teaching a back handspring is an important tool for gymnastics coaches and coaches in similar fields. A back handspring is one of the most well known gymnastics skills. Most people, whether they are familiar with the sport of gymnastics or not, know what a back handspring is and will ask gymnasts (and former gymnasts) if they can do one. Back handsprings are best taught in tumbling classes at a facility with access to matting, trampoline, and pit surfaces. So what exactly is a back handspring and how do you teach it? How does Coach Heath define it? Jump - a good jump sets up the athlete for success. Each part of the back handspring should be taught independently first. Next, teach the elements in combinations. For example, adding a tight body jump to handstand (over a rollie) is a great first stage of a back handspring. At the same time, teaching the second half of the handspring, including the landing, will help the athlete understand the skill as a whole. When teaching a back handspring, it is important to use consistent terminology. For example, use the word "block" when teaching an athlete to spring off their shoulders. A few recommendations are listed below. Rollie Drill - have the gymnast jump up and over a rollie (or octagon) onto an 8 inch mat where they will land on hands and snap feet over to land on feet with chest up. Falling Teeter Totter - fall over a smaller rollie focusing on shaping and tight body to mimic the motions of a back handspring. Trampoline and Tumble Track - when an athlete is nearly ready to attempt the skill on the floor by themselves, introducing the trampoline or similar surface can help build confidence. Here are a few more gymnastics education resources! Knowing how to spot a back handspring is a key component of teaching a back handspring. The spotter should be experienced with the tactical, physical and mental preparations required to master a back handspring. The number one goal of a spotter is to eliminate the risk of a catastrophic injury, such as a landing on head or neck. When learning how to spot a back handspring, practice by watching and co-spotting with an experienced coach. After you have mastered co-spotting, begin spotting independently on experienced athletes. A back handspring can be spotted on either side of the body, kneeling, or squatting. Hand and arm placement will depend on the level of the athlete as well as body type, overall strength, and the spotter's needs.